No one said senior living has to be small. This statement is especially true for those who have selected the Hatteras villa at Trinity Landing, a future senior living community that’ll occupy a lovely spot right on the Intracoastal Waterway. Set to open in 2021, Trinity Landing will offer Wilmington-area seniors an opportunity to live in a resort-like setting in a beautiful location, while taking advantage of exciting amenities and services. Best of all, residents will have their choice of beautiful, newly constructed residences that will undoubtedly feel like home. With a choice of 15 different apartment home layouts and 7 different villa layouts, you’ll find a floor plan to match your coastal Carolina lifestyle. For those looking for a generously sized, two-bedroom home, the Hatteras villa at Trinity Landing might just be the perfect home base for your next adventure. 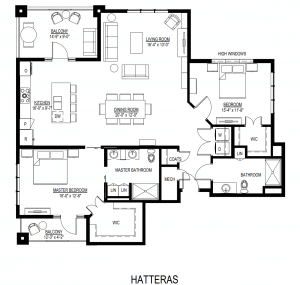 The Hatteras boasts 1,550 square feet, and its open floor plan includes two bedrooms, two full bathrooms, two balconies, two walk-in closets and so much more. This villa has all the space you need and more to host family and friends, pursue hobbies, keep your favorite belongings and relax before or after a busy day in the community. Best of all, the Hatteras homes are located toward the back of each group of Trinity Landing’s villas, providing additional peace and privacy. As you enter the Hatteras, you’ll be greeted by a wide entryway with its useful coat closet, and then the home’s first full bathroom. Just a few steps more and you’ll enter the bright, open-concept living area, which features the kitchen, dining room and living room. Open floor plans are becoming increasingly popular for many reasons, including the advantage they provide when hosting family and friends. Whether you’re prepping hors d’oeuvres in the kitchen, watching a game or serving a meal, you’ll always be part of the action. Just off the open living space are the washer and dryer, smartly hidden behind closet doors, and the entryway to the Hatteras’ second bedroom. Whether you decide to use this space as an office, library, guest room or hobby room, the second bedroom offers bright natural light from its large windows and provides generous storage with its walk-in closet. On the outside edge of the living area is the large balcony with plenty of room for an outdoor seating area, a collection of potted perennials or whatever else you choose. On the patio of the Hatteras villa at Trinity Landing, you can easily enjoy the beautiful Wilmington weather and views any time you wish. The private master suite in the Hatteras will be the perfect place to relax. Its large windows fill the space with warm brightness, and the master suite even features its own private balcony, separate from the one connected to the living area. This private patio will serve as a great spot to sip your morning coffee or tea while taking in Trinity Landing’s beautiful park-like campus, and prepare to enjoy another day of active senior living. Finally, the large master suite boasts double sinks and two linen closets for all your towels and sheets. The suite also features an oversized walk-in closet, giving you lots of space to store your clothes and shoes for any occasion or season. One of the best parts of the Hatteras villa at Trinity Landing will be the welcoming community just a short walk away. You’ll have the opportunity to take advantage of excellent amenities including the waterfront Recreational Pavilion, which you’ll get to in a matter of steps. Around campus, you’ll also enjoy walking paths, multiple restaurant venues, the Wellness Center, the salon and spa, and so much more. And you’ll be a short drive from many attractions in Wilmington such as beaches, restaurants, shopping and museums. When you become a resident here at Trinity Landing, you will also have the assurance of future care if you are to ever need it. You’ll have priority access to services at Trinity Grove, a longtime, trusted provider in the Wilmington area. For more information about what life will be like at Trinity Landing, give us a call today at 910-769-9600, or click here to request our free information kit. We can’t wait to hear from you! Do you buy the villa or rent it? How much does it cost either way?